Nine out of ten Cro-Magnons agree: the Ice Age is a tough time to be a caveman. Considering the sub-zero temperatures, severe fire shortages, and notoriously flimsy outfits, any caveman who isn't working overtime is probably frozen solid. But it doesn't have to be this way! 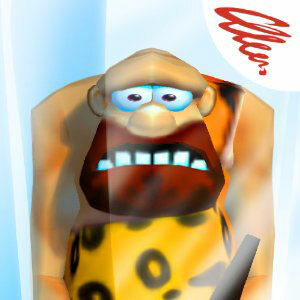 In Ice Cube Caveman, you'll help a caveman live to shiver another day. Maneuver him along a narrow path of icy tiles toward life-sustaining fire, avoiding cracks along the way. Help him escape the ice cube he's trapped in and lead him through increasingly difficult challenges. This logic-based puzzle game looks simple, but you'll discover plenty of challenges as you work through its 60 challenging levels. 3D-like animation and quirky background music create an atmosphere of fun and suspense, and you'll soon find yourself addicted to the rush of saving imperiled troglodytes from a chilly fate. The more cavemen you deliver to warmth and freedom, the greater your bragging rights. Submit high scores to the OpenFeint leaderboard, and boast to your friends about your caveman rescue skills.